Xiaomi, Tata Cliq & Innosolv iDine! Catch the latest launches in the world of Gift Cards, brought to you by Qwikcilver – Everything Gift Cards! Another financial year gone and we are heralding the new year with sound beginnings! Starting with the 2018 edition Qwikcilver Gift Card conclave. With just 7 days to go, this truly Future Forward event is all set to redefine the Gifting Category with the most unique and exciting thoughts, ideas and insights into this exciting category. Adding to that excitement was the announcement of the Qwikcilver has been featured by the globally reputed Harvard Business Review as a detailed Case Study showcasing the impeccable network that we have built across both Processing & Distribution and is showcased as a unique & strong Competitive Advantage in the market. It has become a routine isn’t it where we have new brands hopping on to the Gift Card bandwagon. However, while it may seem routine year on year, trust us, we at Qwikcilver are truly excited every time we launch a new brand. Each and every launch constantly reminds us at to how the gift card is in the thick of the action for every brand and product’s strategy. And did we mention that organizations love our corporate reward programs? Do read on to know more! As always we eagerly look forward to your comments and feedback! 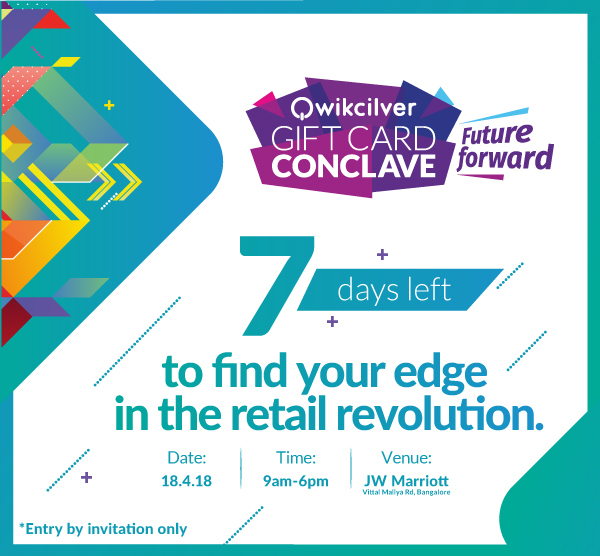 A week to go for the category defining event – The 2nd edition of the Qwikcilver Gift Card Conclave! This one-of-a-kind gift card conclave will feature thought leaders, brand custodians & experts from the world’s fastest growing consumer, retail brands, corporates & doyens of HR from a gamut of industries. Are you going to be there? Extremely excited to announce the launch of the Xiaomi Gift Card program – the Mi Gift Card. This e-Gift Card can be used to purchase products ranging from smartphones, accessories, and televisions to smart devices in the Mi product portfolio. The e-Gift Card comes can be had with a minimum value of Rs. 100 and a maximum value of Rs. 10,000. Notably, a maximum of 10 gift cards can be used in one order. Xiaomi was founded in 2010 by serial entrepreneur Lei Jun based on the vision “innovation for everyone”. Today Xiaomi is the largest Smartphone brand in India and the Fourth largest Smartphone maker in the world. Their product range currently includes Mi and Redmi smartphones, Mi TVs and set-top boxes, Mi routers, and Mi Ecosystem products including smart home products, wearables and other accessories. With presence in over 30 countries and regions, Xiaomi is expanding its footprint across the world to become a global brand. We are happy to announce the launch of the Tata CliQ Semi Closed Gift & Wallet Program. This is first of a kind program where we have integrated both the Closed Loop and Semi Closed loop program features. This program also marks the introduction our Wallet solution to power the CliQ Cash feature. CliQ Cash is a wallet that holds the promotional gift cards as well as semi closed loop gift cards. Tata CLiQ is a first-of-its-kind Phygital marketplace that combines online shopping with the offline store experience, to serve over one million customers. Within a year from launch, Tata CLiQ is in the Top 10, and one of the fastest growing, e-commerce websites in the country. One can enjoy a seamless shopping experience across desktop, tablet and smartphone while exploring the best Indian and international brands across clothes and accessories, gadgets and appliances. They also provide a unique offline experience through their CLiQ & PIQ, Ship from Store, Return to Store and Order in Store services across 1,000 stores and 50 partner brands to pick up, try on and test, and exchange or return from the instore purchases. Marching ahead with product launches beyond gift cards, we are pleased to announce the successful integration of our Qwikcilver application with Innosolv’s iDine POS system. The integration has been done in a generic manner that would provide us the flexibility to deploy the application as a single package to our future customers. This integration will now enable the management of the Order to Payment (using prepaid instrument) process end to end. Showcasing the versatility of the Qwikcilver platform, we now provide a complete solution for Food Court Business. This integration also enables the adoption of Qwikcilver solutions for all those Food Courts / Restaurant Chains who are currently using Innosolv iDine POS. Innosolv is a technology company that builds powerful business products and iDine is their flagship ERP product. Built for standalone and multi-chain restaurants, QSRs, cafes and patisseries, pubs and breweries, catering firms, central kitchens and food courts – iDine is a comprehensive business solution that covers multiple parts of the F&B business, from POS, Inventory and Accounting, HR & payroll, Assets and Promotions. Our client – large prominent FMCG company usually ran trade schemes to increase sales. They were looking at running a trade promotion scheme that would see an increase of sales and offer added value through exciting reward options instead of the traditional trade scheme that all companies run. Qwikcilver proposed to run a scratch card-based incentive program. The process was simple and would offer incentive to their channel partners on more purchases. We generated and printed over 50 lakh unique codes to the client. Each unique code was mapped to a reward value ranging from mobile top ups, jewelry, mobile phones and bikes. This unique solution enabled the client to launch a trade promotion and with an intention to increase sales of its products during the peak season. Our client was looking for a simple foolproof system to ensure their channel partners purchased more stock and hence occupy more share of shelf at the retail stores; and the results of this program are speaking for themselves. Our client is one of the largest and oldest FMCG companies in India. The client was running a traditional channel rewards program and incentivization for their channel partners with cash. Expectedly they faced multiple issues with incentivization and therefore had approached us to revamp the program and offer more exciting rewards to its channel partners. The request was placed for an end to end channel program. To enable easy redemption, Qwikcilver also provided for call center-based redemption model that is drastically simpler than a website-based redemption. Our in-house design team designed a beautiful welcome kit that contained a gift card personalized with their name and a welcome letter. Regular communication through SMS on target achievement, points balance ensured competitiveness to earn more points. The results and the feedback from the channel partners has ensured that the client has confirmed the addition of more regions to the new program and bring all the retailers under the new revamped program. 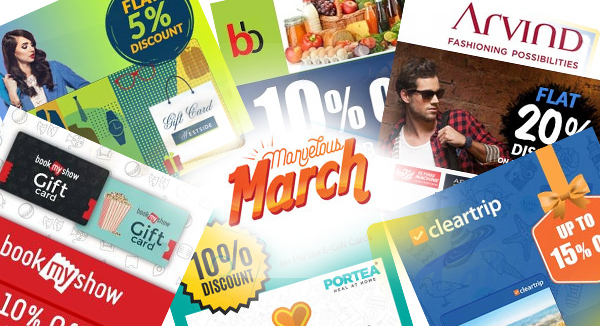 In the month of March, aptly named Marvelous March, Woohoo collaborated with leading brands to bring out some exciting offers. The offers ranged from 10% to 15% discounts on brands like Cleartrip, Portea, Arvind Brands, BookMyShow, BigBasket and Westside. Following Marvelous March, we have “Awesome April” happening right now! Cleartrip, Faasos, Thomas Cook and Four Fountains Spa are brands vying for eyeballs with their exciting offers! Check out all the “Awesome April” offers here.